Bill Graham is a freelance outdoor writer, photographer, bluegrass musician and singer-songwriter. Sam Bush was sitting in his tour bus, talking about the increasing role for mandolin playing from solos and background licks in modern country and folk-rock music, when he brought up a subject I've long wondered about. Many guitarists take up mandolin to bring something fresh to sessions and the stage, Bush said, and they often get to the heart and soul of a song more directly than a more accomplished mandolin player would. "Take Maggie May by Rod Stewart," he said, "we heard that in the van today on the way here from the hotel. I said 'that has got to be the most well known mandolin solo there is.' Because we've been hearing it since what, the early 70s." I nodded yes, because I've often thought the same thing. "I don't even know who played that," Bush said. "Do you know?" There was a debate among his band members with several names tossed out, he said. It turns out, they were all wrong. So, here you go Sam. 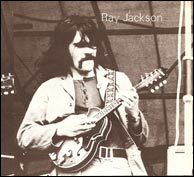 Ray Jackson onstage in 1971 playing his Columbus acoustic-electric mandolin. This is the only photograph he has of himself from that year, when he used this instrument to record the solo heard on Rod Stewart's hit single "Maggie May." Click to enlarge. Ray Jackson, a stalwart on the British folk-rock scene, played the mandolin solo on "Maggie May," as well as on "Mandolin Wind," both songs on Stewart's 1971 "Every Picture Tells A Story" album. A very big reason he's been a mystery player all these years is that Stewart didn't care enough about the mandolin player to let the world know who he was. Even though it was likely Jackson's extended mandolin solo at the end that gave the song a distinctive lilt and lifted it to Number One on the pop charts in both the U.K. and the U.S. The liner notes by Stewart on the LP album cover say: "The mandolin was played by the mandolin player in Lindisfarne. The name slips my mind." Lindisfarne was a folk-rock band based in Great Britain for which Jackson sang and played blues-style harmonica and mandolin until 1990. Stewart's reference in the liner notes helped the band gain a wee bit of recognition, but did little for to promote the musician who developed the Maggie mandolin licks impromptu in the recording studio. Jackson threatened Stewart with a lawsuit in 2003 for unpaid royalties on the basis that he should be considered a co-composer for the "Maggie May" cut. He began wondering about royalties in 1995 when he heard his mandolin solo used in a television commercial for a bank. Apparently no lawsuit moved forward in the courts and Jackson today declines to discuss the matter. But regardless, what remains musically is a recording that's noticed by mandolin players throughout the world, year after year. Bluesman Long John Baldry in 1970 hired Jackson to play mandolin on an album produced by Elton John and Rod Stewart. Later, Jackson was asked to play mandolin for the song "Mandolin Wind" on Stewart's solo album. Heady stuff for a young musician who considered his primary chops to be lead vocals and blues harmonica. "I was hardly 21 years of age and had very little experience of session work apart from with my band Lindisfarne, and one session for Long John Baldry," Jackson said via e-mail interview. "I was very nervous, as I was the only guy on the session. All the other musicians had completed their parts and had left the studio. I was the last player to overdub on the album before it was mixed. There was only Rod and the engineer behind the glass and I was out on the studio floor"
His ax was a Japanese-made "Columbus" acoustic-electric mandolin with a metal adjustable bridge and a flat back. Engineers put two AKG microphones on it and got a studio sound from it that Jackson says he hasn't been able to repeat. He still owns the mandolin. 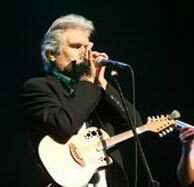 "The track I was asked to play on was Mandolin Wind which I listened through to a few times," Jackson said. "Once I had completed the solo. I was asked if I could come up with something on another track (Maggie May) which may or may not be included on the album. "I was played the end a few times which is where Rod wanted 'that something' to be. I came up with the part on the spot, double tracked it a few times and was invited to listen back in the control room. He seemed pleased with the result and I left the studio. I was paid the standard musicians union three-hour session rate for the time, which now wouldn't buy more than a few beers." He was paid 15 Pounds for his playing on the two songs in 1971, roughly $30 U.S. dollars. "Maggie May" was released by Stewart as the B side for "Reason to Believe," the cut destined for Top 40 radio play back in the days of 45-rpm singles. But Maggie became the hit. "It was to everyone's surprise," Jackson said. "The song at first wasn't going to be on the album." I'd argue that Maggie's popularity is in large part because of Jackson's mandolin solo. He gave the song a punchy, pretty, melodic line. And his mandolin's woody resonance drew music listeners burnt out on rock and turning to roots music for a more-grounded, fresher sound. Plus, the mandolin's homespun sound meshed with a burgeoning back-to-the-earth movement in the early 70s. My first mandolin was a Japanese-made, A-style Conqueror, purchased in the summer of 1973 for $35. I can still hear one of my buddies telling me that summer, as I practiced my tremolo: "I don't care much for bluegrass mandolin like that, but I like the kind of mandolin like Rod Stewart played on Maggie May." Rod not only failed to mention Ray in the liner notes, via assumption he was anointed the mandolin player by many listeners. Another buddy of mine, a seasoned Nashville pro, just recently told me he also thought Rod Stewart played the mandolin part on the record. I'd always guessed that the Maggie soloist was a British folkie who possessed an extra nice vintage Gibson F2 or F4. But for most folks, what counts is that Jackson's rousing Maggie solo brought the mandolin sound to many ears unfamiliar with the instrument. And that continues to this day. I hear Maggie played on the oldies radio station in my area, on the FM classic rock stations and even as an oldie on the FM progressive station that specializes in modern, indie roots and rock music. There's a chance some of us mando Yanks will even get to see Jackson live and shake his hand. Ray Jackson on stage today. After a long hiatus, Jackson is back in the music business with a band called The Gathering, which includes various British music scene notables. He's 59 and lives in the west Oxfordshire town of Witney. The Gathering is planning an album release this fall, and if it's released in the United States, they may tour here in 2009. And what does Jackson think when he's credited with the most listened to mandolin solo of all time? "Well I suppose I was just in the right place at the right time," he said. "There weren't many mandolin players in the UK around the early seventies who did sessions. "I'm flattered that Sam thinks it is the most recognizable mandolin solo of all time. It really is the most simple of performances, mainly played in the D shape and double tracked many times. I wrote the part on the spot and it was what felt natural to fit with the track." Current stage ax: "I have an Ovation Celebrity acoustic electric which I like the sound of in both modes." Website: Ray Jackson is an artist with a website and bio information at www.rayjacksonart.co.uk. His mando inspirations: "Cisco Huston on early Woody Guthrie recordings on the Folkways Label, and later on Bill Monroe, and Chris Hillman from The Hillmen and later The Byrds.